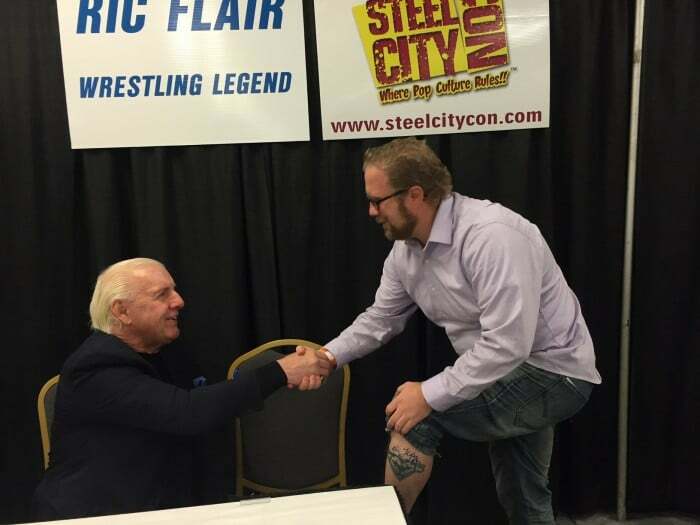 For one night at the Seminole Hard Rock Hotel and Casino in Tampa the crowds were roaring again for pro wrestling legends and Prince Marketing Group clients, Ric Flair and Hulk Hogan. First over the sound system as a loop of their 1994 Bash at the Beach match in front of 14,000 thousand played. Then there was the present day cheering, when Jimmy “Mouth of the South” Hart introduced Flair and Hogan to the Hard Rock Cafe stage for several hundred fans carrying championship belt replicas and wearing Hulkamania t-shirts. The Q&A session that followed brought tales from the road involving alcohol, trashed hotel rooms, bar brawls, pranks, and yes, even some stuff about wrestling. There was the time that Flair showed up at a hotel bar in England wearing one of his sequined robes, wide open with nothing on underneath, and began strutting on top of the bar, and the time Hogan broke into Flair’s hotel room with Vince McMahon and ”rearranged it” (Hogan’s words) before Flair returned with a date to find the place “trashed” (Flair’s description). There was the time Hogan and Flair were on the road for the WCW and drank until 4 a.m. before deciding to prank call McMahon, who at this point was their former boss and chairman of the rival WWE. When his wife Linda McMahon answered, Hogan panicked and handed the phone to Flair, who ended up getting cursed out by the upset woman. “I said, ‘I don’t think either of us is ever going back to the WWE’,” Hogan said. There was the time in Dayton, Ohio (or maybe it was Jacksonville? 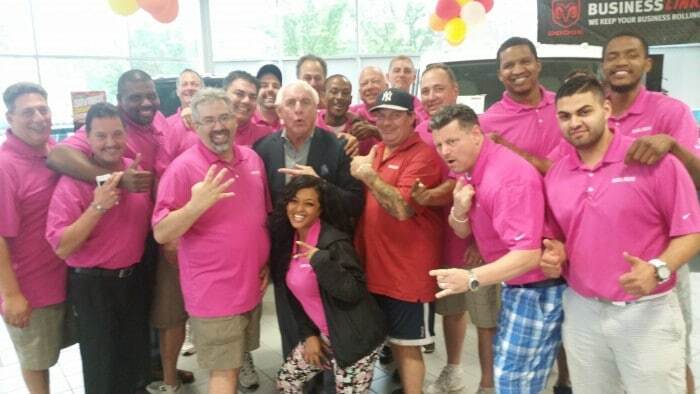 ), when Flair invited an entire restaurant’s worth of Hooters girls back to his and Hogan’s hotel. After convincing a reluctant Hogan to party with them, Hogan woke up to find his wallet was missing. Flair was missing a Rolex. “We should have went looking at Hooters,” Flair said. There was the night at New York’s famed China Club when a group of wrestlers was out and the tag team duo known as the Nasty Boys stomped on Flair’s friend’s sunglasses and stripped him naked, so Flair slapped one of them and got hauled out by the bouncers. Hogan ended up getting handed the bill, but realized the waitress had mistakenly put everyone’s $3,500 bar tab on Flair’s credit card. “I hurried up and forged his name, and left the biggest tip you’ve ever seen,” Hogan said. Hogan, 64, and Flair, 68, obligingly answered questions about their favorite matches (Hogan’s was Wrestlemania III when he bodyslammed Andre the Giant, Flair’s was that match against Hogan in ‘94 and matches versus Dusty Rhodes and Ricky Steamboat), their favorite bad guys (Hogan said Andre, Flair said Roddy Piper), and the genesis of their catchphrases (“wooh” was modeled after Jerry Lee Lewis, “brother” came from Hogan struggling to remember anyone’s actual name). One fan who said he’d traveled all the way from Germany for the event got on the microphone just to tell the men thank you. Steelers linebacker Anthony Chickillo was in the audience, and others had driven from Alabama. Flair left the Hard Rock Cafe escorted by security guards. People turned from their slot machines to take photos. He was surrounded by women, and smiling.